Overlooking the Savannah River, an empty-nester home – rustic with added bits of whimsy – is the perfect place for a Martinez couple to roost. With views of the water from every room and plenty of toys to enjoy the great outdoors, Tammi and Rob Pavey’s home on a cove off the Savannah River offers the best in waterfront living. Two or three nights a week the Paveys venture out on the Savannah River to boat or kayak past Horseshoe Island, Sumter National Forest or Stevens Creek Dam, where the creek flows into the river. The Paveys also enjoy spending time with their neighbors – whether it’s 90-year-old Aunt Cile, who invites friends over for steak night every Tuesday, or the deer, otters, beavers, herrings, ospreys, bald eagles, teals, wood ducks and mallards that come to visit. If they’re not on the river, then the Paveys can sit outside on the front porch, which features stacked stone and wood beam columns, or on Adirondack chairs on the wraparound porch to soak in the view. 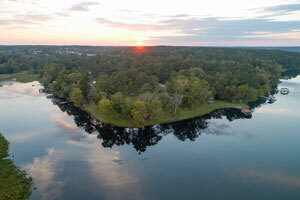 When they first bought the 0.8-acre property five years ago, however, it was hardly fit for man or bird or beast. The land was buried under golf car batteries, roofing shingles, debris from the 2014 ice storm, weeds, trees and poison ivy, but the Paveys were not deterred. They cleaned up the prime piece of real estate and tore down a small house that was on the property. “It took two years to build the house because there wasn’t a house plan that would fit on this weirdly shaped lot,” says Rob. Rob built the steps and boat launch in the backyard. He used boulders that were on the property to construct a retaining wall, and earlier this year he built a fire pit in the backyard. He also grows tomatoes, garlic, jalapenos and sweet banana peppers in a small garden. “Everything that is beautiful about this house, Robbie did,” says Tammi. Not that he didn’t have some help along the way. 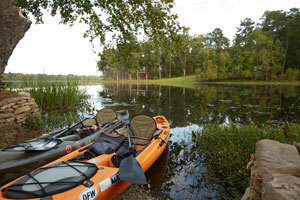 The kayak launch was an original feature of the property. One of their three grown sons pulled out the old sunken dock on the property, went on Craig’s List to buy floatation that survived ice storm-destroyed docks and built a new boat ramp. The interior of the house has Tammi’s touch all over it, however, from the furnishings and whimsical accents to the color schemes. 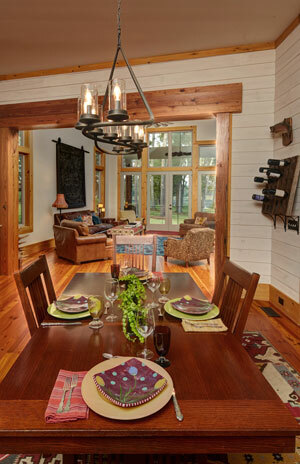 With its rustic design, the house features flooring that is made out of reclaimed antique heart pine, pine beams in some of the ceilings and side tables that were cut from leftover beams. The house also includes lots of pocket and six-panel doors. Furnishings in the foyer pay homage to their family history. A serpentine desk that belonged to Rob’s grandfather, who was a railroad executive, sits against one wall. A grouping of 19th century train pictures – situated around his grandfather’s poker table once upon a time – hangs above the desk. Tammi creates a speakeasy atmosphere in the entry with a nickelodeon – a precursor to the jukebox – and a stained glass overhead light fixture. Her father refinished the nickelodeon, which features Tiffany glass. “I’ve begged, borrowed or stolen every single thing I have,” says Tammi. A wide entryway, framed by heart pine beams, leads into the kitchen, where heart pine cabinetry lines the shiplap walls. One side of the room features open shelving made of antique heart pine beams mounted to the wall by iron plumber’s pipe. Granite countertops, a pot filler, a walk-in pantry and stainless steel appliances, including a wine cooler and an icemaker, accent the kitchen. Stained glass pictures in the kitchen windows provide a barrier to the outside without obstructing the view. However, the blue-gray island is the focal point in the room. The island has a black honed granite countertop, and one of Rob’s friends made the bar on top of the island out of a live-edged piece of eastern red cedar. The shiplap walls extend into the dining area, where a light fixture above the table runs parallel with the water outside. 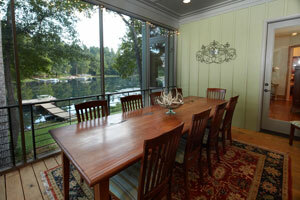 A handcrafted dining room table provides more room for dinner guests on the adjoining screened-in porch. The living room features a cathedral ceiling with heart pine beams, 12-foot walls, a wood-burning stacked stone fireplace and a windmill ceiling fan in oiled bronze with weathered oak blades. Tammi chose to use the same paint color on the walls and ceiling for continuity. 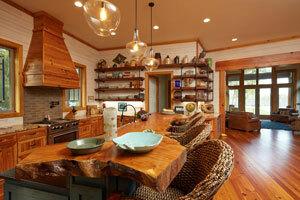 Extra-wide window sills and casings in the room are made of rough-hewn cypress. “The carpenter originally put the smooth edges out, but we wanted the rough side exposed,” Rob says. Accents range from colorful blankets that are folded up in a bread trough to a duo of shadowboxes that holds Rob’s collection of arrowheads. An upside-down queen-size bed headboard hangs on the wall above the couch, and a plaque with a pair of moose horns, which also happens to be mounted upside down, is tucked in a corner of the living room. Rob, an avid hunter and fisherman, found the moose horn plaque at a flea market in Maine, but the house is full of other wildlife trophies that he bagged himself. While the flooring in the rest of the house is reclaimed antique heart pine, the master bedroom flooring is modern pine. The room also features pine beams in the ceiling, and the round bedside tables were painted by Doug Larson. He is one of many local artists whose work is on display in the Pavey house. One wall in the master bath is made of leftover antique heart pine, and the mirrors are framed with leftover heart pine as well. 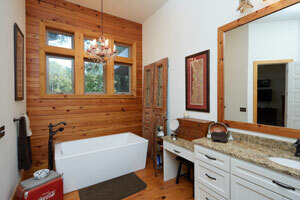 The walk-in tile shower has pebble flooring, and the countertops are made of granite. Next to the tub sits a vintage Coca-Cola ice chest. “I used to like Coca-Cola stuff, and that’s one of the things I kept,” says Rob. “We call this place ‘The Fish House’ because that’s what the house that used to be here was known as,” says Rob. A covered balcony off one of the upstairs guest rooms includes a ceiling fan and Adirondack chairs. However, a hanging bed is an inviting spot to lounge for anyone who wants to enjoy the space in style. Tammi sawed the legs off the bed, which has a bolster pillow on each end, and hung it with rope. For all its creativity, the house wouldn’t be complete without Rob’s extensive collection of fishing lures. The pre-World War II, small-maker lures, along with their original boxes, are showcased in shadow boxes along the walls in a spare bedroom. He keeps the boxes to add insight to the maker and the era in which the lures were made. Published on October 20, 2018 in Home & Garden, In The Home.